During a 26-game span in May-June 1998, “Slammin” Sammy Sosa rode one of the hottest streaks in MLB history, slugging an unheard of 20 home runs in a single month and hopping into the hearts of millions of fans worldwide. On May 25, 1998. Mark McGwire was lighting the world on fire. He already had 24 home runs, in just 45 games, and was on pace to crank out 85 towering home runs, as only “Big Mac” could. Fans and pundits alike were predicting that the largest Cardinal of them all wasn’t just going to break Roger Maris’ 37 year-old record, he was going to shatter it. Entering that day, Sammy Sosa had just nine home runs. 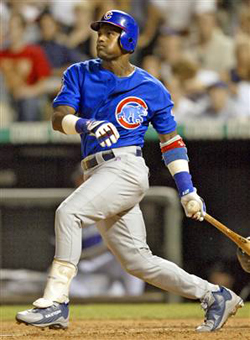 He was hitting well, living up to the hefty four year, $42 million deal the Cubs had given him in the off-season. But that day, Sosa decided he didn’t want to be merely living. He didn’t want to be a mortal. He didn’t want to be Sammy Sosa. He wanted to be Slammin’ Sammy—America’s favorite hero. So he went out and hit two crowd pleasing home runs. The Cubs had a day off the 26th but the next day, Sosa hit two more home runs. He didn’t hit any on the 28th, but then he hammered another two homers the next game, June 1. On the 2nd, he was once again held homer-less. Are you sensing a pattern? Well, on June 3, Sosa only hit one home run, and, in order to balance things out, he hit one more the next day, and the next day, and the next, until he had a 5-game home run streak going. Then he rested. Going into the All Star Game, Sammy had 33 home runs; 20 in the month of June alone. He was hot as a firecracker, suddenly only four behind McGwire. America prepared itself for a race. They were going to be racing against Maris, against each other, and against the odds that said no two players would surpass the 60 home run barrier in the same year. And with Sosa and McGwire chasing the record, the two were going to meet head-to-head as history was being made. In the second week of September, the St. Louis Cardinals and Chicago Cubs met for a two game series in St. Louis. It was only two months after the All Star game, and the gap had narrowed even further. McGwire had 60 Home Runs; Sosa 58. Sammy would be held homer-less in the series, while McGwire tied and then passed Maris during the homestand. Five days later Sosa would put Maris in his rearview with another patented two homer game, but by then his Cardinal rival had too big a lead. The pair of slugging friends and heroes eventually finished with 70 (Mac) and 66 (Sammy), but no one who watched The Great Home Run Chase of 1998 will ever forget the way “Slammin Sammy” streaked his way through June of that year.